Paul de Clerck is the economic justice programme coordinator for Friends of the Earth Europe. The European Union, the world’s biggest trading bloc, is, for the second time in a matter of months, on the verge of seeing one of its mega trade deals fall into disarray. If the objections of several regions in Belgium are upheld, the signing of the Comprehensive Economic and Trade Agreement (CETA) with Canada planned for next week will most likely be cancelled. This follows the near collapse of TTIP, the EU’s proposed agreement with the US. Rather than despairing at the state of the EU, we should see how these developments provide a unique opportunity for the EU to take the lead in shaping new trade regimes for the future that are beneficial for people and the environment. The opposition to CETA and TTIP has been unprecedented in the history of the EU. Concerns have been expressed by millions of people across the continent, including lawyers, academics, political parties, local authorities and virtually all sectors of civil society. Many governments have also expressed reservations on CETA. Only the Walloons, however, had the guts to show it the red card. Wallonia, the Belgian region taking the lead in its steadfast opposition to CETA, is doing us all a favour. For a start, they are exercising their democratic right to raise concerns about a proposed EU deal. One of the most important issues raised by Wallonia is how CETA would give power to foreign investors to sue governments for huge compensation if democratically agreed decisions to protect citizens or the environment interfere with their profits. Wallonia faces not only substantial financial liabilities, but also a serious impairment to its democratic decision-making powers. It is only normal that the region should have its say in this matter. Secondly, the Walloon parliament has actually gone further than most other governments and parliaments in the EU: it seriously looked at the text of CETA and debated the pros and cons of such an agreement before taking a principled position. Sadly, similar criticism of CETA in Germany led to the drafting of an additional declaration to the agreement that acts as a palliative without addressing any of the issues raised, especially when it comes to the controversial investment chapter. Again, the Walloons are right to not be fooled by this PR exercise and remain steadfast in their opposition as long as their concerns are not answered properly. The predictable scare-mongering by the political elite has already begun. They claim that if CETA fails then the EU would no longer be able to make such trade agreements in the future. But what if this was a good thing? Negotiated under former prime minister Harper, one of Canada’s most conservative leaders in decades, the claims that CETA is the most progressive trade agreement ever made is total nonsense. At best, the agreement will just shift goods – and jobs – from one continent to another. In all likelihood, it will shift the balance of power away from democracy towards big corporations and traders. The intense debate of the last three years on TTIP and CETA shows these agreements do not stand up to the slightest bit of scrutiny. Nor do they deal with any of the pressing global issues. Yet the impacts of increased liberalisation and globalisation at all costs are open for all to see: rising inequality, unabated damage to our planet and increasing disenchantment with mainstream politics, as well as the EU project. So it should be no surprise to see citizens standing up and saying enough is enough. It is time to develop a new trade policy for the EU and national governments that is publicly acceptable, transparent and fit for the future. A new trade regime should contribute to cutting inequalities, eliminating tax evasion, halting the collapse of biodiversity and preventing climate change. It should strengthen our democracies by ensuring public safeguards and laws are agreed openly and away from the hands of trade negotiators and big business. Citizens also have a keen eye for fairness. Our new trade deals should not just be about protecting our own interests but also allowing other regions in the world to develop sustainably and fairly. The EU can and should take the lead in shaping this. If it takes the Walloon government to throw a spanner in the CETA works and create the political space for an open discussion on what Europe really needs, we fully support them. Wallonia will not just protect its 3 million inhabitants. It will also defend the interests of the vast majority of the EU’s 500 million citizens. Our European decision-makers should grasp this opportunity. Now is the chance for the EU to light the way ahead, reclaim social democracy and lead on establishing an economic system that contributes to a more equitable and sustainable world. This matter warrants a referendum! CETA and other trade deals for big business are just that, they are not for the average person and bring no personal benefits. I am the average Canadian and will get no benefit from this deal either and would urge everyone to say no to the corporate elite & big business. 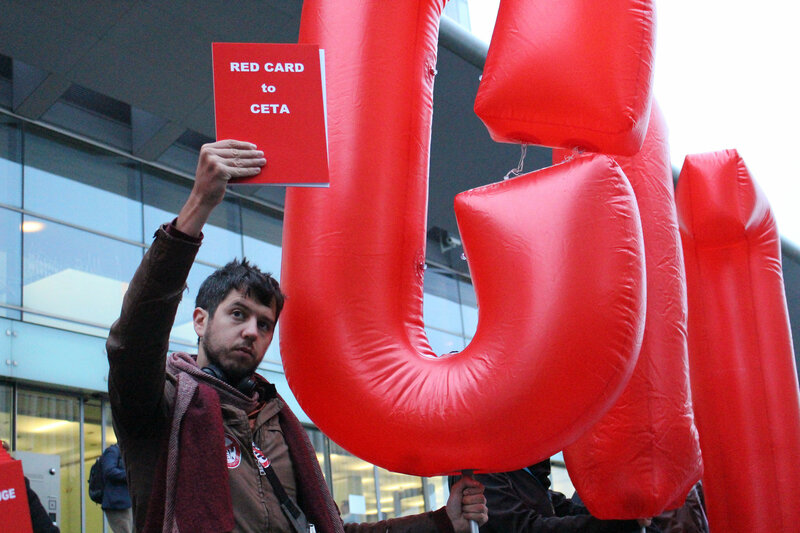 CETA and TTIP have generated unprecedented levels of public opposition in the EU. The people aren’t stupid as the greedy suits would like them to be. Life’s complicated. What is wrong with cheaper food for the poorest in society? Give Wallonians their belge franc back and purge barriers on it !